Our laboratory has expertise in software development for designing image analysis tools, from simple application to contextualized multi-parametric analysis. Not being dependent on software solutions, it is possible for us to design custom made image analysis solutions meant for very specific problems. This design work is always performed jointly by our IT and scientific teams. This method of automatic analysis makes it possible to recognize the different types of tissues, and to quantify the stain or label used. In this way, the intensity and/or the labelling area are obtained. These measurements may be compared among themselves, and provide a relevant description of biomarkers (proportion of tumor cells, collagen tissue, etc.). In this video, we measure the intensity of labelling to quantify the p-EGFR receptor in a xenograft model. This enables us to determine its degree of expression, which gives us indications regarding the efficacy of the treatment tested. The segmentation of certain tissue structures can be analyzed with the angle of their spatial distribution. A tool has been developed for the purpose of characterizing the spatial distribution of objects of interest within a histological section (vessels, cells, etc.). It is thus possible to characterize quantitatively, the more or less homogeneous distributions, more or less concentrated in space. – Erode: the layer is eroded successively, the number of erosions necessary to eliminate it completely, enables us to determine its thickness. – Vector: linear measurement along one direction given by the operator. – Orthogonal: local measurement of thickness along the direction orthogonal to the guiding line of the layer. The application makes it possible to investigate, according to all combinations of layers, which would be the most relevant to describe a condition, the response to a treatment, etc. In this video, we show a method to quantify tissue regeneration after lesion by measuring the thickness of the epidermal layer. A segmentation tool makes it possible to select the pixels in the image from a given criterion. This criterion is most often a threshold of the intensity of staining or labelling. The area occupied is thus calculated from this selection of pixels and the calibration data. The area measurement tool in this video enables us to determine the gonado-somatic ratio (percentage of the area occupied by the gonads) of oysters. This indicator makes it possible to track proper reproduction in farms. Image registration is a method which involves finding the geometric transformation to enable the superimposition of two images. This transformation may simply be a combination of a translation and a rotation or, in a more complex way, a deformation field. Image registration makes it possible to automatically superimpose several similar histological sections. These serial sections would have been subjected to various stains / labels. The interest then, is to be able to compare the sections among themselves, and to automate the comparative quantitative analysis. Colocalization of 2 labels: – TNF-α : growth factor involved in inflammatory reactions – ALU probe: which characterizes human immune cells Together, these 2 markers make it possible to test the efficacy of treatments on Crohn type lesions, for example. 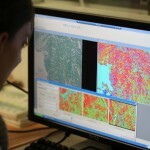 A comprehensive Tissue Micro Array (TMA) analysis tool has been developed. This application of image processing makes it possible to cut a TMA, to identify the various spots and to apply an image analysis algorithm on each spot (eg. : quantification of IHC labelling). In this video, we present the evaluation of cross reactivity with TCR on frozen human Tissue Micro Arrays (TMA). The segmentation tool enables rapid and inexpensive screening of the different TMA spots during early assessment of toxicity. It also eliminates the need for any manual operation, which makes the results more robust and dependable. Some applications implement the principle of granulometric (particle size) analysis. This type of analysis makes it possible to study the distribution of measurements made in the images, including particularly, that of the area. One may thus describe the distribution of large or small objects within a set of segmented objects by specifying the size categories. In this video, we show an image analysis method enabling the characterization of spatial distribution and the granulometry of tumour infiltration using ALU probe labelling on xenografted mouse brains. The purpose is to quantify the presence of micro metastases which occurred after the injection of human tumour cells. An application has been developed to automate the counting of segmented objects. Filters may be applied to eliminate the undesired objects and artefacts. Additional options are available to separate pasted objects. In this video, we show an image analysis technique, developed by HISTALIM, which makes it possible to highlight and quantify the copper deposits in a mouse liver (disease model).